Bette Midler says she’s “one of the funniest people I know.” Garry Shandling told her, “You write like a guy.” Her words have come out of the mouths of President Barack Obama, David Letterman, Homer Simpson, Sheryl Sandberg, and Kermit the Frog. You’ve almost certainly laughed at Nell Scovell’s jokes—you just didn’t know it until now. For over thirty years, writer, producer and director Nell Scovell AB '82 has worked behind the scenes on some of TV’s most iconic shows, including The Simpsons, Late Night with David Letterman, Murphy Brown, Monk, NCIS and The Muppets. She was the creator and showrunner of Sabrina the Teenage Witch and later teamed up with Sheryl Sandberg AB '91 on the blockbuster book Lean In, which resulted in a worldwide movement. 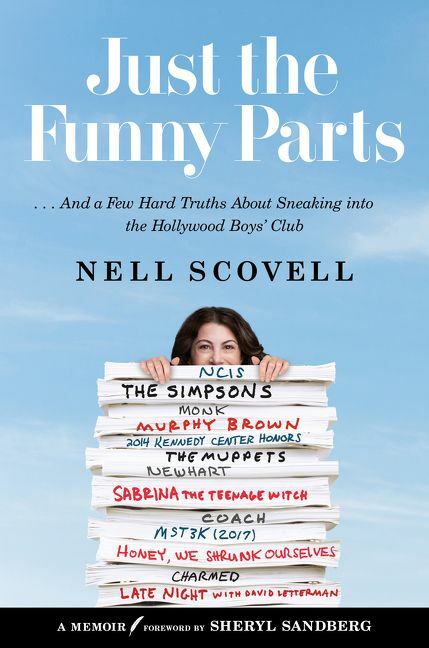 In JUST THE FUNNY PARTS: … And a Few Hard Truths About Sneaking into the Hollywood Boys’ Club, Nell dives deep into three subjects that she loves: comedy, writing and equality. Readers will get first-hand accounts of what it’s like to work with some of Hollywood’s stars while getting hard-earned advice on the TV creative process from writing jokes to directing movies. On the evening of April 18th in Los Angeles, attend this intimate discussion with Nell, who will be interviewed by Harvardwood Co-Founder Mia Riverton Alpert AB '99. Nell will be sharing stories that did not make it into the book... book signing to follow the event. Advance registration is required, as seating is limited and we need all attendees' names in advance to be added to the security list.